One of the keys to consistently eating a healthy diet is planning. I make a weekly meal plan, taking into consideration my day off and the kids’ evening activities. I also plan to make extra food at most meals so that we will have leftovers available for busy evenings. This solves the “what are we having for dinner?” nightly crisis. I may deviate from the plan if I find something else my family likes on sale, but it gives me a guideline for the week. For instance, today is my day off, so I had planned to go to Earth Fare and the new seafood market. However, poor Dora came down with a stomach virus in the middle of the night last night, so shopping was off the table for me. This didn’t make me throw in the towel and order pizza. I asked Tom to stop at Publix on his way home and pick up pork chops, fresh veggies and chicken soup. Dora doesn’t care for pork chops, so she didn’t mind that the rest of us ate them while she had canned soup. I placed asparagus and Brussels sprouts in the oven to roast while I prepared the pork. I also heated up the last of the red cabbage. This meal was as quick to prepare as many of the packaged meals on the market, and of course it tasted much better. 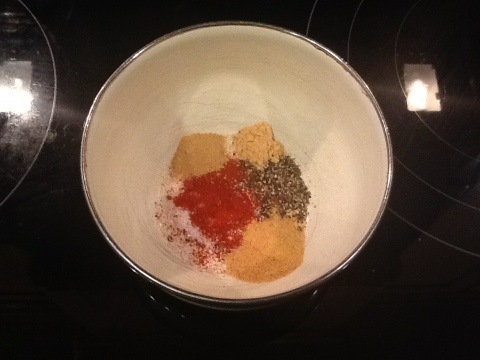 Mix spices in a small bowl. I was excited to try the paprika Mom brought back from her recent trip to Budapest. Rub the spice mixture onto all sides of the pork chops. 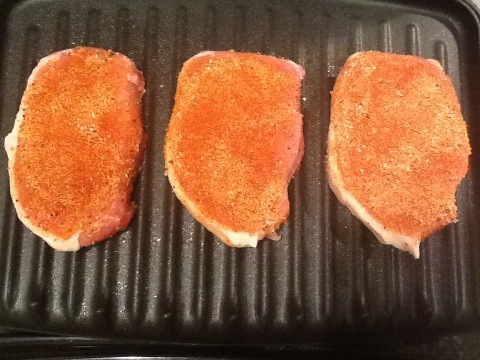 Place the pork chops on a pre-heated George Foreman grill. 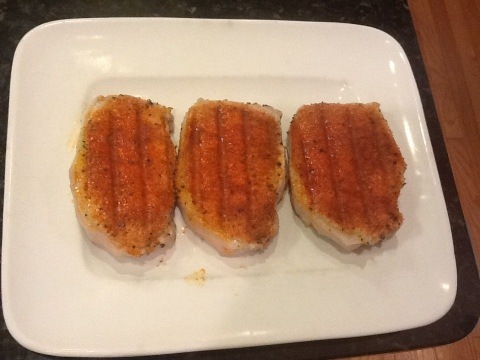 The pork chops are done in 6 minutes! Comments: Honestly, it’s not as if I have a pantry full of cookies and chips. I didn’t even have any crackers for Dora! Comments: I couldn’t leave Dora at home alone, so I did strength training rather than an aerobic workout. Daily challenge: balance work, home, a sick child, cooking meals, cleaning up, making it to a doctor’s appointment all after having missed out on deep sleep last night due to cleaning up vomit. Comments: I doubt that this is what Mark Sisson had in mind. Daily needs-to-improve: Getting back into the habit of exercising.